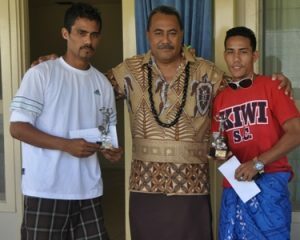 Samoa Football > News > SamoaTel National League > Football season comes to a close. Football season comes to a close. The Women’s final matched up SamoaTel Women’s Premier League Champions Kiwi against Adidas. Kiwi had gone through the entire season undefeated and twice defeated Adidas by a 4-1 and 4-2 score line. Despite this, underdogs Adidas showed in the first half that they could keep up with the favourites. Both teams created half chances, but it was Adidas who took the lead just before half time through striker Lanuola Mulipola. Down 0-1 at the break Kiwi started the second half firing, pushing forward and creating several good scoring opportunities. Adidas on the counter attack were than awarded a penalty mid way through the second half, which could have given them some more breathing space. Unfortunately for Adidas the penalty went wide left. Despite the missed penalty Adidas were able to hang on for a hard fought 1-0 win. Despite the loss Kiwi Captain Viona Schuster was still very proud of her team performance“ We were prepared for the game, but most of our key players had injuries from our last game. We were unable to play as well as we wanted to, but considering all those injuries I am very proud of my team. We are still the league champions, we are unbeaten and Kiwi’s spirit will never be down and we will come on stronger for next season”. 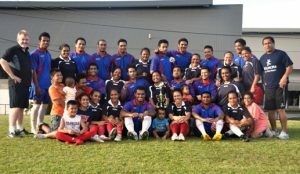 The Men’s final saw a repeat of last year’s cup final between Kiwi and Moaula United. Prior to kick off one might have been forgiven for thinking that Kiwi would retain the trophy, especially since they defeated Moaula in last years final and had only lost one match out of six in the last two years over their opponents. The first half produced some great attacking football with both Mouala and Kiwi scoring two goals each. At the start of the second half Moaula striker Rudy Gosche put Moaula ahead 3-2 with his third goal of the match and the momentum and the match went with Moaula. As a result Moaula continued to produce an excellent display of attacking football to come away with a 5-2 win. Moula United captain and goal scorer Fereti Gosche was delighted with the win “I want to thank the team for their great support, especially our coach and also to Kiwi for playing a great game today. We trained hard before this game especially on ball skills and fitness. I am also very happy that I was able to score a goal today in the final”. Prior to the Men’s and Women’s Cup Finals, the finals of the boys under 15 division between Lupe Ole Soaga and Moataa needed a penalty shoot out to determine the winner. Both teams failed to score after normal and extra time. In the end it was Moataa who had their noses in front much to the delight of their fans. Previous Post Joy at Football Grounds. Next PostSamoa wins 9-0 against American Samoa. Football season officially warps up with prize giving. Interview With Kiwi SC Coach. 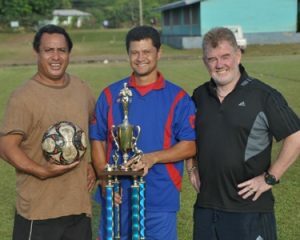 Samoa wins 9-0 against American Samoa.